A career in practice management is an exciting opportunity with a wide range of responsibilities. As a Practice Manager (PM), you are the leader of your team and manage the day-to-day operations of your practice. 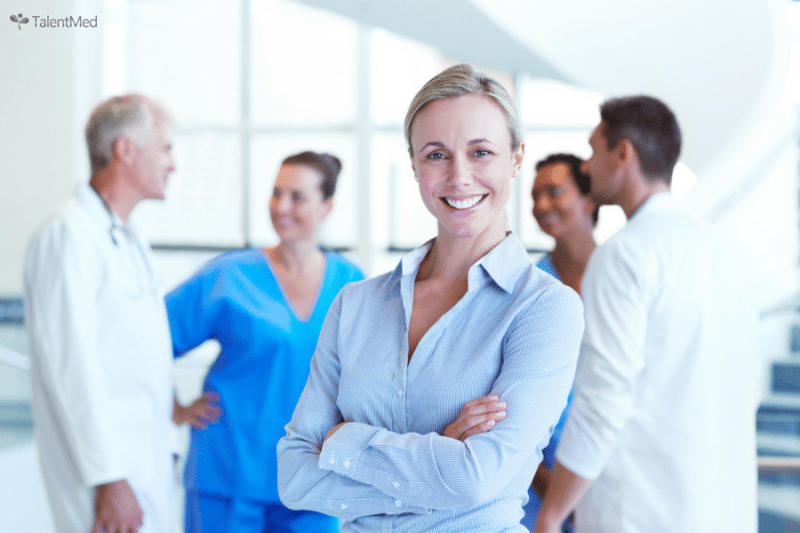 When looking for a career as a practice manager, there are many pathways available. To help you learn about this dynamic role, we have created the ultimate guide to becoming a practice manager. 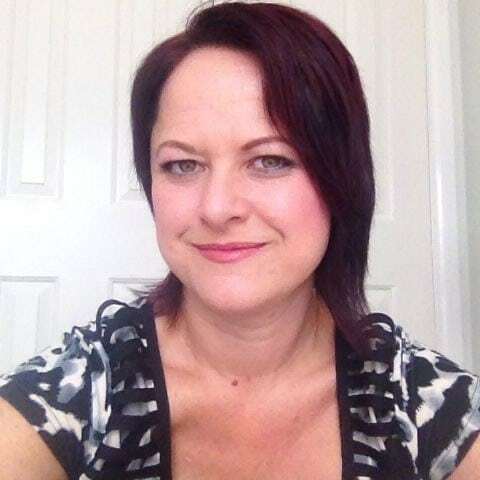 What is the job outlook for Practice Managers? Where does a Practice Manager work? What are the pay rates for Practice Management? How do you become a Practice Manager? Healthcare is now Australia’s largest industry by employment. With the increasing demand for healthcare, there is now a real shortage of well-trained practice managers. A practice manager is responsible for managing and coordinating the day-to-day business operations of a practice, therefore, they are the glue that holds the practice together. The role of a practice manager is constantly changing as they have a wide range of functions, however, this depends on the type and size of the practice. With their passion for providing high-quality patient care, and creating a strong team culture, practice managers can positively contribute to the health and well-being of others. A strong demand for practice managers. A growing healthcare industry, which requires practices to have substantial resources. A need to sustain the quality requirements. According to Industry Employment Projections Report, employment for practice managers has grown by 81% in the past five years and is expected to continue to grow until November 2020. As a result, over the next five years, the demand for practice managers is expected to grow to 31,300, as shown below. A practice manager is a highly valued team member with a wide range of skills, hence, they are an important part of the development of their practice. If you would like to find out if you could be suited for a career in practice management, take our Career Path Quiz here. What are the benefits of working as a Practice Manager? You are a leader of your workplace, therefore, you can shape the work environment and team culture to reflect your values. You wear a lot of hats, as you have a wide range of functions. This provides more variety in your role, making the workday more interesting and enjoyable. You can work across different industries based on your interests, therefore, this allows you to expand your horizons and explore different industries. You have a positive impact on others. With their passion for providing excellent patient service and care, practice managers can positively contribute to the health and well-being of others. A workplace coordinator is the backbone of a practice, as they empower and support the team in accomplishing their goals. Workplace coordinators are required to provide the delivery of office management, supplies, document processing and manage access control. A junior practice manager is responsible for managing their team and providing support to the business manager. Their role involves putting policies and procedures in place that keep the practice running smoothly, while also responding to any issues that arise. 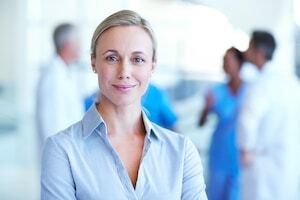 A senior practice manager is responsible for the development and operations of their practice. Their role is to lead, develop, and manage their team, as well as implement policy and procedures in accordance with the values and goals of the practice. A multi-site practice manager is responsible for the business operations of multiple practices. Their role is to manage both internal and external stakeholders, as well as lead their teams across these practices. Source: *Pay Scale Website. 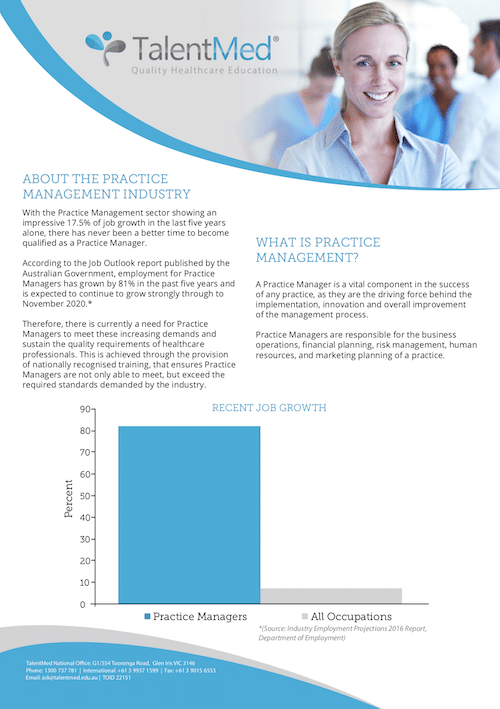 The graph shows the average salary for practice managers in Australia. 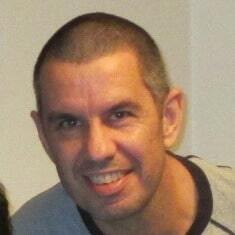 In Australia, the average pay for a practice manager who is at entry-level is $58,000 per year. For a practice manager who is in their mid-career, the average pay is $62,000 per year, while a practice manager who is in their late-career, the average pay is $64,000 per year. Furthermore, to find out the pay rate for each state, please check out our blog. A nationally recognised qualification, such as the Diploma of Practice Management. TalentMed’s Diploma of Practice Management is designed to help provide you with the leadership and management skills needed to advance or change your career in practice management. Qualified trainers are available from the moment you start the course all the way through until course completion. Built on numerous years of experience in training high-quality practice managers, the Diploma of Practice Management helps you quickly gain the knowledge and skills you need to get a job and excel in the workforce. In conclusion, if you would like more information on how you can pursue a new career in Practice Management, you can request a free information pack below! Let’s get started! Simply enter your details below to receive a comprehensive industry and course outline. 5 Home Based Jobs that don’t require a large outlay to get started! I am so excited to be a part of this new journey as a Medical Transcriptionist – I have found no other option that is as stable, rewarding or reliable as qualifying through TalentMed with a Diploma in Healthcare Documentation. This is absolutely fantastic, I have been able to combine my love of technology, English language and the human body by learning about the field of medicine. All of this leading to a career which I can do from home with flexible hours to allow me to be with my family. Having the flexibility of studying at my own pace and then working from home was very appealing. I must say that I have found the course to be very well organised and easy to follow. The support has been exceptional.